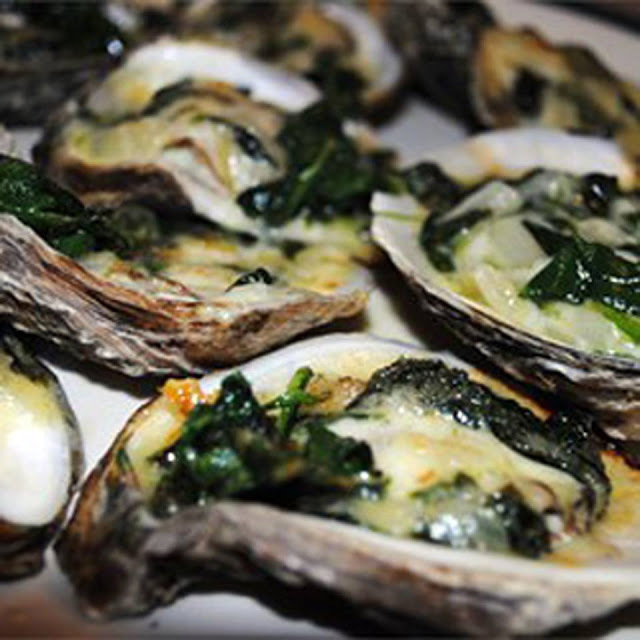 Oysters Rockefeller were created in 1899 by Jules Alciatore of Antoine's restaurant, in New Orleans, to make use of local shellfish and greens. Named for John D. Rockefeller, this classic first course is likewise rich. Though Louisiana oysters tend to be quite large, it's best to use small ones, such as Kumamoto or Prince Edward Island, for this recipe. The oysters themselves (not the shells) should be no more than 1 to 1 1/2 inches in diameter. Toss together watercress, spinach, scallion greens, parsley, celery, and 1 tablespoon plus 1 teaspoon bread crumbs in a bowl. Melt butter in a 10-inch heavy skillet over moderate heat, then add watercress mixture and cook, stirring, until spinach is wilted, 1 to 2 minutes. Stir in Pernod, cayenne, and salt and pepper to taste, then transfer mixture to a bowl and chill, covered, until cold, about 1 hour. While watercress mixture chills, cook bacon in cleaned skillet over moderate heat, turning, until crisp, then drain on paper towels and finely crumble. Spread 5 cups kosher salt in a large shallow baking pan (1 inch deep) and nestle oysters (in shells) in it. Spoon watercress mixture evenly over oysters, then top with bacon and sprinkle with remaining tablespoon plus 2 teaspoons bread crumbs. Bake oysters until edges of oysters begin to curl and bread crumbs are golden, about 10 minutes. Serve warm oysters in shells, nestled in kosher salt (about 5 cups), on a platter.